Tourism ministry document put on hold by security sources calls for another gate for Jews and tourisms - now ten of 11 are for Muslims only. A document published by Galei Tzahal (IDF Radio) on Monday morning reveals that the Tourism Ministry is considering opening the Cotton Merchant's Gate to the Temple Mount for Jewish visitors and tourists. As the status quo stands, the Mughrabi Gate is the only point of entrance for Jews in visiting the holiest site in Judaism, and that point of access has repeatedly been targeted by Arab rioters for attacks as a means to force the closure of the site to Jews. The large number of Jews and tourists trying to visit the holy site has led to long lines at the lone non-Muslim gate to the Temple Mount, which is located by the Kotel (Western Wall). Due to the backlog, the Tourism Ministry is apparently considering measures such as opening an additional gate. Yehuda Glick, head of the LIBA Movement for Freedom of Movement on the Temple Mount, told Galei Tzahal that the status quo must be changed urgently. "There are 11 entrances to the Temple Mount, ten of them open to Muslims, but only one open to tens of thousands of tourists and Jews who want to enter the Temple Mount," said Glick. "Each day the numbers waiting on line increase...this gate doesn't meet the needs." The document was drafted in January, but the Tourism Ministry says it was not advanced mainly due to opposition by security sources to the move, given that it would require a heavy increase in security and likely spark further rioting and violence by Arab visitors to the Temple Mount. That violence has already been reaching a peak in the "silent intifada," with Arab mobs two weeks ago on Wednesday ahead of the Jewish New Year (Rosh Hashana) launching rocks and fireworks at police as soon as the Mughrabi Gate was opened. That same day Interior Security Minister Yitzhak Aharonovich (Yisrael Beytenu) denied terrorism is on the rise in Jerusalem. Israel has left the Temple Mount under de facto Jordanian Waqf (Islamic trust) control since liberating the site in the 1967 Six Day War. 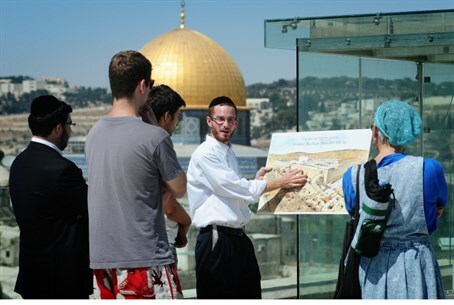 Under the Waqf, Jews are forbidden from praying at their holiest site. By contrast, Israel allowed 500 residents of Gaza to visit the Temple Mount this Saturday on Eid al-Adha, a Muslim holiday celebrating Abraham's "sacrifice of Ishmael" in an appropriation of the original Torah story, as a "goodwill gesture" in ceasefire talks with the Hamas terrorist group. Previous moves to change the status quo have been met by vociferous outcry in the Arab world, particularly in Jordan, which last month was able to force Israel to dismantle a temporary bridge built alongside the Mughrabi Gate bridge that was meant to ease entry for non-Muslims.